In Tuesday night’s debate, Seattle mayoral candidate Cary Moon said she would like to hire former rival Jessyn Farrell. Her opponent, Jenny Durkan, said she’d hire Moon. Remember Seattle’s mayoral primary, back when there were 21 candidates? General-election opponents Cary Moon and Jenny Durkan were asked Tuesday night which of their former rivals they might hire to help run things at City Hall. 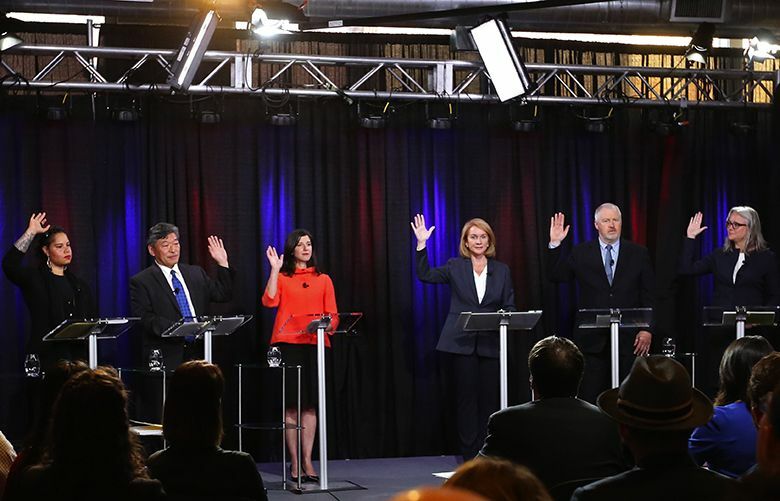 Moon praised Jessyn Farrell, Nikkita Oliver and others during a debate hosted by KING-TV, while Durkan name-checked Bob Hasegawa, Oliver, Farrell — and Moon. But the former U.S. attorney then mentioned Hasegawa, a state senator and labor leader who campaigned in the primary on the idea of starting a city bank. Then she brought up a pair of U.S. presidents. “It’s kind of like Lincoln. He had to have the whole sense of, you know, bring your rivals in. And we saw that with President Obama. So I would hire Cary Moon, you know,” Durkan said. Some in the audience laughed when the moderator asked Moon whether she’d accept a job under Durkan. Asked about a business tax proposed by two City Council members earlier this month, both Moon and Durkan expressed reservations. To help pay for shelters and housing, Councilmembers Mike O’Brien and Kirsten Harris-Talley want to apply a tax of 5 cents per employee per hour on businesses with annual gross receipts of $5 million or more. Moon said she supports taxing big businesses more but believes the O’Brien and Harris-Talley proposal would affect too many small businesses. Durkan also said the proposal would hurt small businesses. She expressed no support for a new business tax.